[266 Pages Report] Dispersant/Dispersing agents are used as additives to provide a uniform mixture of particles and to prevent clumping and setting. It is produced using different types of chemicals such as lignosulfonates, polycarboxylate, etc., depending on its usage in different industries. The production of dispersing agents is the growing trend in the market due to increasing applications in construction, paints & coatings, pulp & paper, detergents, oil & gas, agricultural, pharmaceuticals, and other end-user industries. Among these, construction industry is dominating the dispersing agent market due to rising developments in the infrastructure sector. The value chain of the dispersing agent market includes raw material suppliers, dispersing agent manufacturers, and the end-user industries. The raw material suppliers are the companies that supply the various chemicals such as acrylic acid, polycarboxylate, napthalene sulfonate, lignosulfonates, etc. The dispersing agent manufacturers include companies such as BASF SE (Germany), Ashland Inc. (U.S.), Arkema Group (France), The Dow Chemical Company (U.S.), and Clariant AG (Switzerland) among several others. The end-users are the various industries such as construction, paints & coatings, detergents, etc. The dispersing agents market is highly fragmented in terms of end-user industries. The companies engaged in the manufacturing of dispersing agents comprise both small and medium sized companies as well as top chemical giants located in different geographies. This market is growing at a fast pace in Asia-Pacific region due to increased demand from end-user industries and rapidly growing infrastructure facilities. The market is growing slowly in Europe, whereas it will continue to grow at a significant rate in North America. However, it is still at its infancy in Africa and Latin America. The dispersing agent consumption is estimated to be 3,960 KT in 2013 and will grow by 6.7% annually till 2018. The current demand in dispersing agent market is majorly concentrating on emerging end-user industries and modernization of infrastructure. 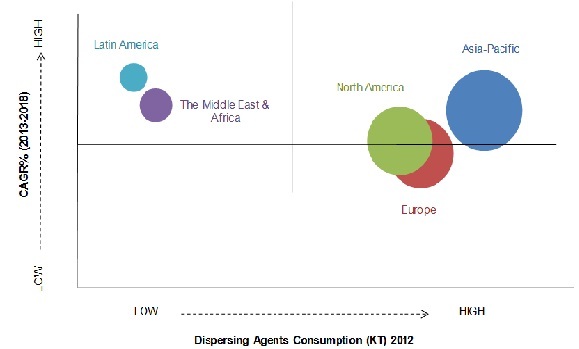 The prolific demand from oil & gas industry, and rising environmental concern are the other key factors driving the global dispersing agent market. This report analyzes various marketing trends and establishes the most effective growth strategy in the market. It identifies market dynamics such as drivers, restraints, opportunities, and winning imperatives. The major companies such as BASF SE (Germany), Clariant AG (Switzerland), Cytec Industries Inc. (U.S.), The Dow Chemical Company (U.S.), etc. have also been profiled in this report. The global dispersing agent market witnesses a high growth on account of the rapidly growing construction, paints & coatings and oil & gas industry. This has resulted from increasing demand for energy, infrastructure facilities, and automobiles, especially in regions such as Asia-Pacific. The dispersing agent market is fragmented with a wide range of players that range from small and medium sized chemical companies to large players. Construction, paints & coatings, pulp & paper, detergents, oil & gas, agriculture, and pharmaceutical are the major end-user industries for dispersing agents that show a high growth potential. Other end-user industries such as textile industry, printing inks, cosmetics, etc., have not commercialized the use of dispersing agents and are thus set to record a lower growth rate. Dispersing agents are the additives used for an easier and stable suspension of particles in liquids. They help improve the workability of fluids by reducing the viscosity of dispersion. Due to these properties, there is a growing demand for dispersing agents from both existing and emerging end-user industries, thus driving the market. Also, the shift from solvent based systems towards water based systems has helped reduce the VOC (Volatile Organic Compounds) emissions in the environment, thus creating an increased demand for dispersing agents. However, fluctuations in the cost of raw material and lack of innovation in the industry restrain the growth of the dispersing agent market. Asia-Pacific is identified as the largest as well as highest growing market in the next five years among all regional markets. Europe and North America accounted for the second and third largest markets respectively for the dispersing agent consumption. 8.1 Air Products & Chemicals Inc.
8.6 Cera - Chem Pvt. Ltd.
8.20 Uniqchem Uk Co. Ltd.